Just one look at their anchor-shaped logo should be a clue to the centuries old maritime heritage of Ulysse Nardin. 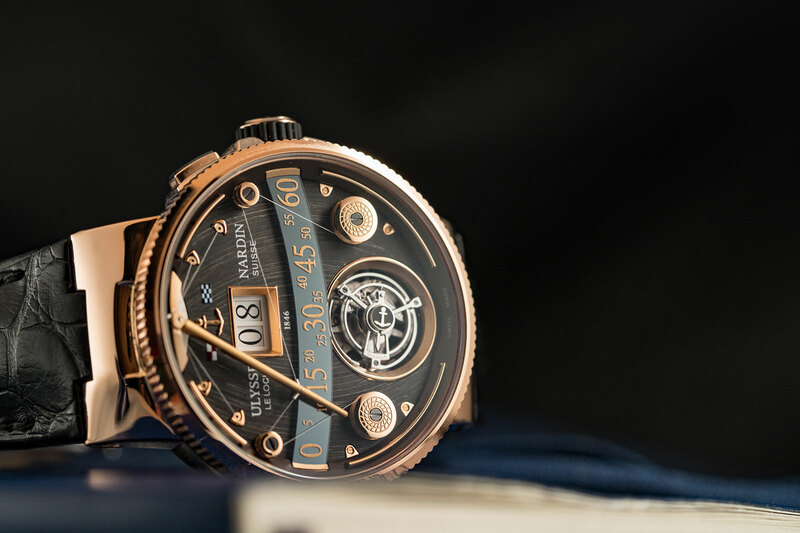 Their Marine collection, which has hoisted the sails for more than 20 years, was last year celebrated with the release of the mesmerisingly complicated Ulysse Nardin Marine Grand Deck Tourbillon. After all, UN aren’t only about the high seas. Avant-garde designs and clever complications are common throughout their catalogue. 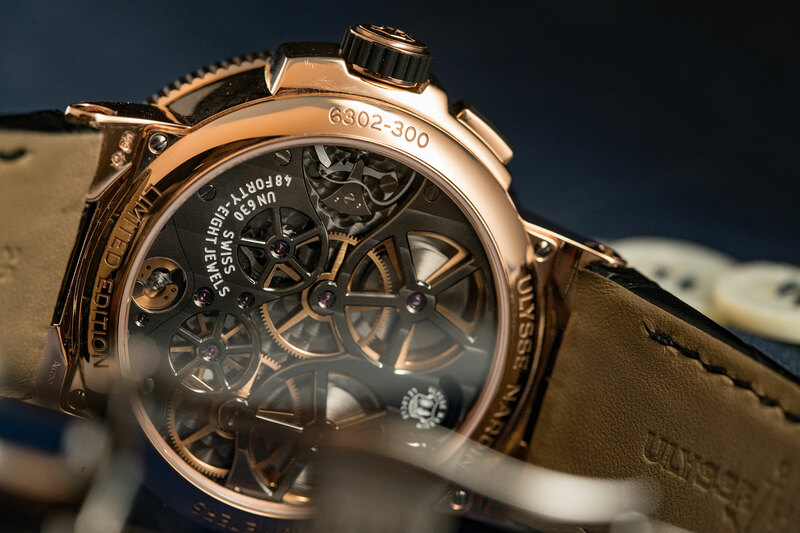 This year, UN have added a warm touch to the Marine Grand Deck Tourbillon, with a darker colour scheme and a change of material for the case. Now made from 18k rose gold, the case remains sized at 44mm, and shares most of the same design codes as the rest of the Marine collection. It still has the same fluted bezel, integrated lugs with leather strap, and screw-down rubber-coated crown – helping to maintain its 100m water resistance. However, as with the original, the star of the show is the way in which the Marine Grand Deck Tourbillon displays the time. Top and centre of the dial is a large jumping hour display, which is quickly and independently adjusted by a pusher at 2 o’clock. 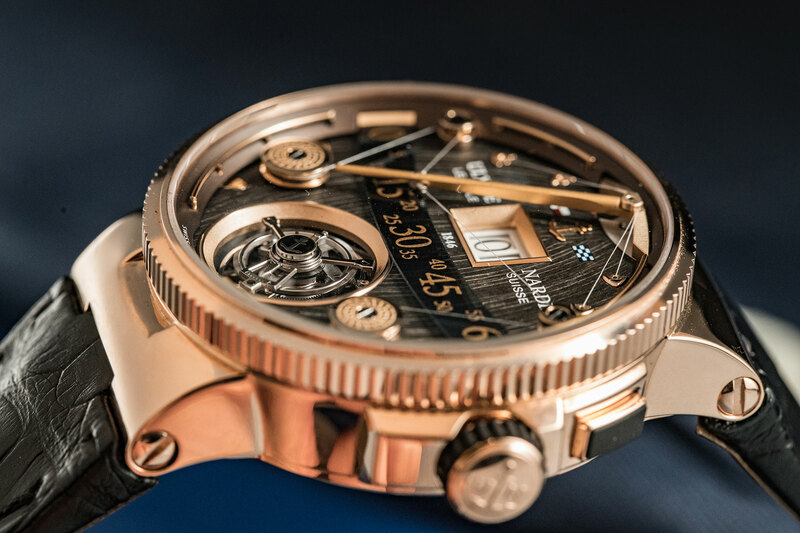 Working in conjunction to display the minutes is a series of pulleys and winches, which use high-strength nanowires to pull a retrograde-style minute hand along a brown smoked spinel arc in the centre of the dial, with the minutes displayed in gold. Rather than snapping back to zero, at the end of 60 minutes the hand gently returns and not only resembles the boom of a sailboat but also functions like one. The seafaring themes don’t stop there either. The dial is a marquetry of thin strips of a now dark chocolate pin oak, making for an incredibly realistic impression of the deck of a ship. The rose gold of the case is matched on the dial, and along the outside are miniature handrails, like that found on a yacht. Beating away underneath is the manually wound Caliber UN-630, which uses two barrels — one to power the unique time display, and the other to drive the time-keeping. It also has a power reserve of 48 hours, and a 60-second flying tourbillon which is visible through the front at 6 o’clock. 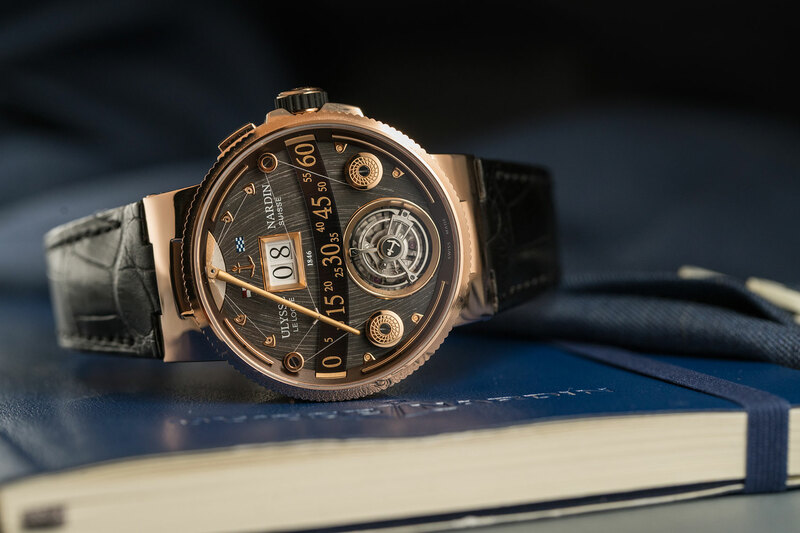 Limited to only 18 pieces, and despite having a tourbillon, the most entrancing thing about the Ulysse Nardin Marine Grand Deck Tourbillon is its ship-in-a-bottle-for-the-wrist design.